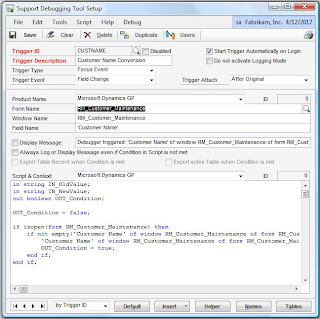 For those of us who work in development environments, the Script Debugger Tool is essential to unit test and follow code released into QA -- note I say QA, the Script Debugger was not conceived to be used in Production environments -- perhaps a reason why this issue has not been fixed by Microsoft yet! 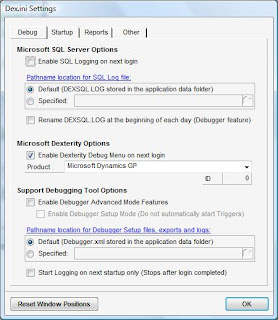 When the Script Debugger Tool is activated -- by adding ScriptDebugger = TRUE in the Dex.ini file -- a Debug menu is added to the Dynamics GP menu bar. I have noticed the menu reorganized itself randomly when switching between Dynamics GP and Modifier or even when closing the application and reopening it. The behavior is consistent even when the Toolbar has been locked via the Navigation menu options. This has been identified as a bug in the Dexterity runtime engine, but has certainly not made it into Microsoft list of fix priorities. Ever asked yourself why Dexterity developers are so hard to find and in such a high demand? Do you have experience programming in other development environments and still looking to bring another environment under your belt? Sweat it no more! Integrated Business Group (IBG) in Orlando is featuring Leslie Vail, fellow MVP and by far one of the best Microsoft Dynamics GP Certified Trainers. The training will take place in Orlando, Florida from October 20 to October 24, and will be providing the basic foundations any Dexterity programmer must have. Integrated Business Group will consider running the Dexterity II training, pending the outcome of this session. This course (previously known as the Dexterity Advanced Integration Techniques) is a 5 day course featuring integration techniques with the Microsoft Dynamics GP application. For more information, contact the training coordinator, Roxanna Alvarez at ralvarez@ibgnet.com or at her direct line +1 (407) 965-9299. David has published two very detailed articles regarding the automatic deployment of customizations. Article I explores the different deployment scenarios for dictionaries and application files with pros and cons for each configuration, while Article II explores the automation of the deployment of customizations. However, the articles do not cover complex deployments in Citrix and Terminal Server environments and are not recommended for upgrades or deployment of new clients. Drop a comment to David and let him know how (or how not) you can use his suggestions. I have seen this question posted in multiple shapes and forms, but could well be rounded up as follows: "I installed Microsoft SQL Server with an Arabic_BIN collation. In addition, I installed Microsoft Dynamics GP on my server and a few clients. All my clients can access the system with no problems. However, I have this one user who 'accidentally' switched his/her Windows locale to English (United States) and is getting all sorts of errors when accessing the system or trying to enter transactions or master records." This is not at all uncommon, but to put an end to the myths sorrounding this issue it is necessary to understand how collations work in both Microsoft Windows and Microsoft SQL Server. Windows collations are collations defined for SQL Server to support Windows locales. By specifying a Windows collation for SQL Server, the instance of SQL Server uses the same code pages and sorting and comparison rules as the Microsoft Dynamics GP client that is running on a computer for which you have specified the associated Windows locale. For example, the French Windows collation for SQL Server matches the collation attributes of the French locale for Windows. There are more Windows locales than there are SQL Server Windows collations. The names of Windows locales are based on a language and territory, for example, French (Canada). However, several languages share common alphabets and rules for sorting and comparing characters. For example, 33 Windows locales, including all the Portuguese and English Windows locales, use the Latin1 code page (1252) and follow a common set of rules for sorting and comparing characters. The SQL Server Windows collation, based on the Latin1_General code page and sorting rules, supports all 33 of these Windows locales. Also, Windows locales specify attributes that are not covered by SQL Server Windows collations such as currency, date, and time formats. Because countries and regions such as Great Britain and the United States have different currency, date, and time formats, they require different Windows collations. They do not require different SQL Server collations, because they have the same alphabet and rules for sorting and comparing characters. In SQL Server, Windows collations are combined with a series of suffixes to additionally define sorting and comparison rules based on case, accent, kana, and width sensitivity. SQL collations are a compatibility option to match the attributes of common combinations of code-page number and sort orders that have been specified in earlier versions of SQL Server. Many of these collations support suffixes for case, accent, kana, and width sensitivity, but not always. In SQL Server 2005, you should primarily use Windows collations. This is particularly true if you have a mix of Unicode and non-Unicode columns in your database. Windows collations actually apply Unicode-based sorting rules to both Unicode and non-Unicode data. This means that SQL Server internally converts non-Unicode data to Unicode to perform comparison operations. This provides consistency across data types in SQL Server and also provides developers with the ability to sort strings in their applications that use the same rules that SQL Server uses. SQL collations, on the other hand, apply non-Unicode sorting rules to non-Unicode data, and Unicode sorting rules to Unicode data, by using a corresponding Windows collation for the Unicode data. This difference can cause inconsistent results for comparisons of the same characters. Therefore, if you have a mix of Unicode and non-Unicode columns in your database, they should all be defined by using Windows collations so that the same sorting rules are used across Unicode and non-Unicode data. You should use SQL collations only to maintain compatibility with existing instances of earlier versions of SQL Server or to maintain compatibility in applications that were developed by using SQL collations in earlier versions of SQL Server. There can be differences in performance between Windows collations and SQL collations, but that would be topic for another blog. For now, if you need to change your DYNAMICS or company databases collation, make sure to check back in the future where I will discuss a few methods to accomplish this. The first thing most of us learn from working with any relational database and software development language is how to perform common table operations (create, read, update, and delete). It is no different with Microsoft Dexterity. If you've read through David Musgrave's recommendations for getting started with Dexterity, then the next logical question is how to begin working programmatically with tables. This post will not focus on the in and outs of the table creation process, however, a brief explanation of some concepts that is required to move forward. When you create a table in Dexterity, you’ll use or define several elements required for the table to store and access information properly, such as fields, keys and table relationships. Before you create tables, be sure you have previously defined all the fields that you’ll be using to store information in the table. If you are creating applications that integrate with Microsoft Dynamics GP, be aware that Microsoft Dynamics GP table structures CANNOT be modified. Because you can do so, does not mean your should. 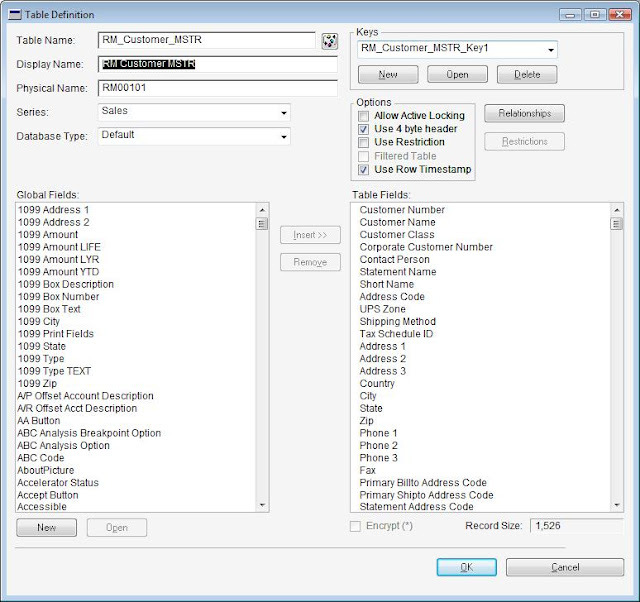 Any additional information (say for example Customer Hotel Preferences) must be stored in extended tables with the same primary key used by the original Dynamics GP table, which in turn will allow you to setup table relationships. Maintaining GP tables intact will facilitate applying service packs and performing upgrades to your Dynamics GP application. You will use the Table Definition window to create a table. I always recommend a careful review of the Dexterity Programmer's Guide Volume I manual provided with Microsoft Dexterity which explains the table creation process in detail. Each time a table is attached to a form, a table buffer is automatically created for that table. If you attach a table to more than one form, each form will have its own table buffer for that table. 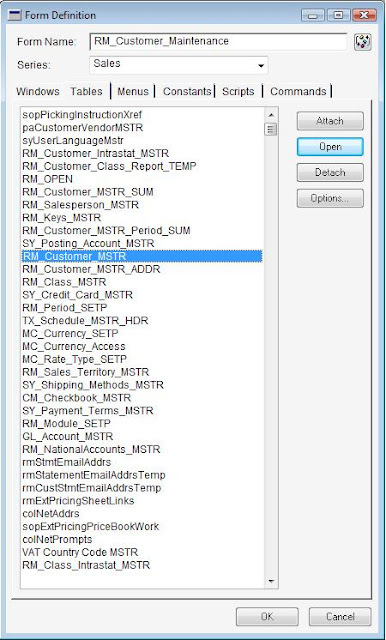 The following example shows all the tables attached to the RM_Customer_Maintenance form. When the form is opened in the application, each table buffer is loaded into memory ready to receive a record. A table buffer usually contains one record which comes from either windows that are part of the form or from the table, depending on whether the record is being read from the table or being stored from the window to the table. It is perhaps a good time to check David's latest article on discarding changes from transaction windows as it is very intertwined with the implementation of forms, windows, and table buffers, along with some referential integrity issues that may show up when saving information to multiple tables at once. Now that you understand some of the concepts let’s move on to common table operations. Typically, as with other development environments, data in tables is a direct result of users’ interaction with the application windows. Data is constantly transported back and forth from windows to tables and from tables to windows where users can perform subsequent operations on the data such as create new records, retrieve existing records, perform updates, and delete records. In Dexterity, this transport of data is accomplished via scripting -- SanScript in particular. My next installment will describe in detail how these statements work and the do’s and don’ts when working with them. David Musgrave has published a new blog entry on everything you ever wanted to know about installing Named Printers on a Terminal Server environment. As the original developer of Named Printers, Dave certainly is an authority on the issue and demonstrates it in his latest entry. He makes some bold annotations to help users setup Named Printers effectively and points to some valuable articles he has contributed or in many occasions written. Stop by Dave's blog site, read up, and let him know what you think. Besides my passion for blogging, I have also been writing user-focused Microsoft Dynamics GP articles for MSDynamicsWorld.com for the past few months and in the process, exchanging ideas with folks there like David Gumpert, Editorial Director and Adam Berezin, CEO on enhancing the site's content and editorial direction for the Dynamics users' community around the world. For those of you who may not know, MSDynamicsWorld.com, a GuidePoint Media company, is the a leading independent authority covering the world of Microsoft Dynamics. It is committed to publishing leading-edge integrated content for Dynamics users, prospective Dynamics customers, partners, independent software vendors, and consultants around the globe. With this broad Dynamics community focus in mind, MSDynamicsWorld.com has created an Editorial Advisory Board of which I am now a member of. I have the pleasure of sharing the honors with some of the top Microsoft Dynamics professionals, each in their area of expertise, like Vjekoslav Babic a Microsoft Services consultant; Brandon George. Senior Technical Architect at Sunrise Technologies; Jeff Onesto, Director of Business Development at Advanced Systems Integration (ASI), Inc. and my fellow MVP and Senior Consultant at IBIS, Inc., Mr. Mark Polino. Please visit MSDynamicsWorld.com to get a perspective on the site and feel free to comment on its content. As promised to many of you, I have finally completed and published my new article "Set Up Microsoft Dynamics GP Test and Production Environments on a Budget". In this installment I explore the options available for setting up test and production environments without breaking the piggy. Two of the many options point to setting up simple test companies with production data and implementing several Microsoft SQL Server instances on the same box. Don't forget to stop by MSDynamicsWorld.com and read up. As always, your comments are welcome. These are exciting times for the Microsoft SQL Server database community of customers, administrators and developers. Microsoft SQL Server 2008 was released to manufacturing just yesterday, Thursday. With SQL Server 2008, Microsoft is adding a number of features to improve scalability. New capabilities include support for policy-based management, auditing, large-scale data warehousing, geospatial data and advanced reporting and analysis services. Microsoft plans to release seven editions of SQL Server 2008, including Enterprise, Standard, Workgroup, Web, Developer, Express and Compact 3.5. The 180-day trial version is available for download from Microsoft. SQL Server 2008 Express and SQL Server Compact editions are also available for free download. And get this! Microsoft has said pricing for SQL Server will not increase with the new release. Go get your copy and start playing with it now! 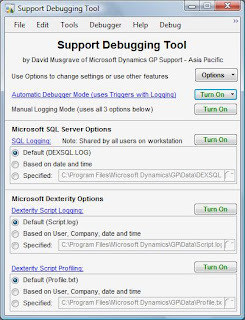 Remember that Microsoft Dynamics GP is also compatible with SQL Server 2008. On a personal note, you have to like the intellisense capabilties in SQL Server Management Studio query editor if you are a developer. I generally try to keep it all things Dynamics GP, but I figured it's a blog -- my blog! In addition, I could not help becoming very enthusiastic about a few articles I came across on some of Microsoft Research initiatives. Lets get started! As many of you may have read or heard, Microsoft has been active on a project to create a new OS code name "Midori" which has been up to now very secretive. According to many sources on the net, Midori is said to be a non-Windows solution, unlike code name "Vienna" also known as "Windows 7" which is currently in development -- any one from Microsoft chip in here -- and is built upon the Vista kernel. Leaks anyone? According to a Software Development Times article I happened to stumble upon, Midori is being built from scratch and is supposely addressing "challenges that Redmond has determined cannot be met by simply evolving its existing technology" -- I guess by existing technology one must understand Windows. Following up on a podcast posted by Mark Polino, MVP, I came across an article dated June 30th, 2008 on Mary Jo Foley's ZDNet blog which also mentions the existence of Midori. Based on my Google searches, this article seems to be, if not the first, one of the firsts in mentioning anything about the new OS. According to SD Times, "Midori is an offshoot of Microsoft Research’s Singularity operating system" with a robust distributed component based and data driven architecture. Translation: ability to transcend the deployment (networking, physical/geographical location, hardware/device, or processing) architecture. If you are interested in reading the latest on Microsoft Singularity OS, click here. If I have got your attention on this whole Midori project, please read the complete article over at SD Times. The folks over at Redmond Magazine have an interesting article where Microsoft expressed it's intentions in joining the Apache Software Foundation. This was announced during the Open Source Convention (OSCON) 2008 held from July 21 - July 25 in Portland, OR. According to the article, Microsoft has steped up the number of employees working on open source projects around the world, but don't get your hopes up! There are only 112 people out of 89 thousand something employees in the company. Long ways to go before some real effort is really put into open source. The article also mentions that Microsoft developers have submitted close to 300 projects to Codeplex which is Microsoft open source developer portal. GEOFF COLVIN: Right. This leads sort of to another fundamental business model issue that has been expressed by some of the folks here, and that has to do with open source, Linux, and other stuff like that. How do you see Microsoft vis-à-vis or Microsoft versus the open source world, and where is it going? STEVE BALLMER: Well, okay. There's a few questions. Number one, are our products likely to be open sourced? No. We do provide our source code in special situations, but open source also implies free, free is inconsistent with paying for lunches at the partner conference. (Applause.) With that said, there are a number of different things. Will we interoperate with products that come from like Linux, from the open source world? Yes, we will. Will we encourage people who want to do open source development to do it on top of Windows? Yes, we're proud that the best PHP system in the world is actually the one that runs on Windows today, not the one that runs on Linux. So we're going to encourage open source innovation on our platforms, and around our platforms. And, you know, we see interesting things where bits and pieces of technology, commercial companies are now starting to provide it in an open source form or to digest in an open source form. And we're open to that as well. But our fundamental business model will remain kind of commercial software, advertising, enterprise licensing, etcetera. You can read the official transcript of the interview here. As it stands, it seems that Microsoft has a lot of thinking and work to do when it comes to open source, but will continue to be a driving force in the development community for years to come as long as companies continue to see the viability and reliability of commercial software. I hope you have enjoyed this snippet of information from around the web and please don't hesitate to drop your comments on some of these news developments.